Because Jack has a fructose intolerance, we don’t give him fruit juice very often. However, there are times where we do give him fruit juice, and when that happens, we make sure we give him the healthiest that we possibly can find, and we always dilute it. I was so excited when I saw the new Motts for Tots products, simply because it has 40% less sugar than other juices, has tons of essential vitamins, and is made with a toddler’s unique nutritional needs in mind. We also often use apple juice and apple sauce as a healthy substitute in foods we make. We’ve found that Jack doesn’t react as much when we cook or bake with fructose products, so we’ve been able to continue doing this even after his diagnosis. We love using the Motts for Tots juices in different dishes, because it gives it such a unique and tasty flair. 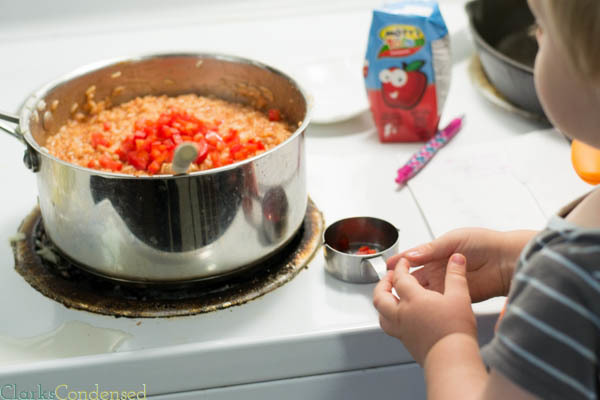 Last week Forrest made a delicious rice dish and used one of the cartons of Motts for Tots (which had a variety of fruits in it.) 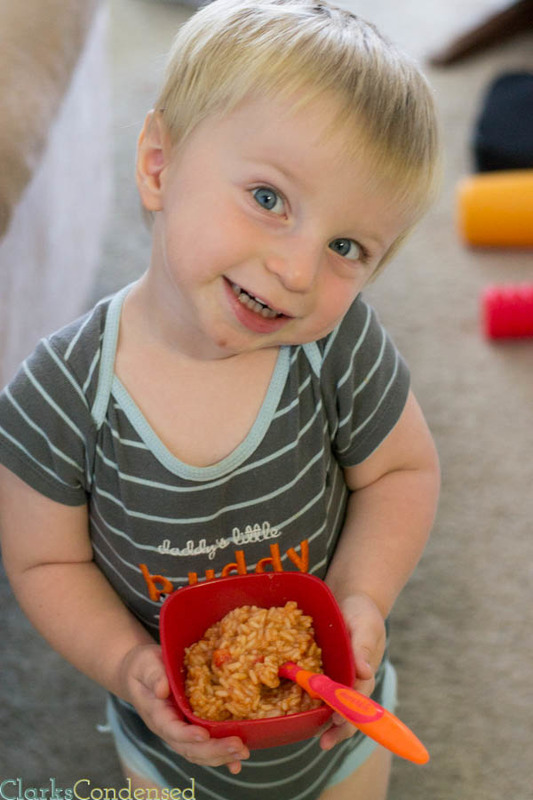 He didn’t tell me that at first, and I told him how the rice was some of the best I’ve ever had — all thanks to Motts for Tots! So even though Jack doesn’t drink juice in the traditional sense that most toddlers do, we are grateful that for when Jack does drink juice, or we use it in recipe, we have Motts for Tots to turn to! Bring water and juice to a boil in a large sauce pan. Dissolve the chicken bouillion cubes. Add tomato paste, cumin, diced peppers, and diced onions; stir to incorporate. This is a sponsored conversation written by me on behalf of Motts for Tots via Burst Media. The opinions and text are all mine.